GDCompany, the creators of Modern Warplanes Thunder Air Strike game has recently released a brand new online multiplayer war battle game for Android on Google Play Store. Pacific Warships Epic Battle game features a wide range of ships, stunning 3D graphics, and a great battle environment where you fight against the enemy team for the victory. 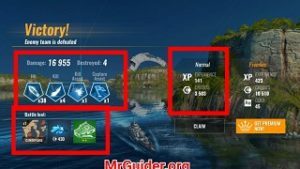 And today, In this post, we have covered everything about the game you need to know: Pacific Warships guide and Pacific Warships tips, cheats & strategy guide to master the game. Before we dive into the cheats, tips & strategy guide part, let’s learn the basics of the game. In Pacific Warships, you play as a commander of a warship in the battle. And it’s a team battle mode so each player’s contribution matters a lot. And there is a fixed time limit in the battle. The team with the most points at the end of the match wins the match. And you will get the reward; XP and credits on the basis of your performance. EXP or XP or Experience points are required to increase the captain level(Rank). As you level up, new warships will get unlocked. However, there are some paid ships and these ships can be unlocked only with the real money. 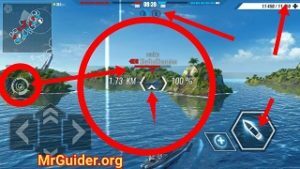 If you want to progress fast in Pacific Warships game, then you need to perform better in the battle. The reason is the game rewards you in-game items(Credits and XP) on the basis of performance. And if you are having trouble winning the matches or enemies are crushing you, then we are here to guide you with our top Pacific Warships Tips, cheats & a strategy guide. So, let’s get started. You will be able to hit the enemy ship if it’s in your range. If it is, then drag your finger across the screen to aim. The arrow icon on the screen states the weapon direction. When it is in the right direction(crosshair), tap the fire button. Double tap the fire button to fire all the missiles(or weapons). All the ships featured in Pacific Warships game have a healing ability. Tapping the + button will call the drones and drones will repair the ship. Indirectly, the HP of the ship will restore. At the top-right corner of the screen, you can check the Ship’s HP(Health). When it reaches 0, your ship will blast. So this is the control guide for the beginners. Now, let’s check out our top Pacific Warships tips, cheats & a strategy guide. In these type of battles, the team with the best coordination gets the benefit. When the battle starts, it’s better to follow the teammates. On the other hand, if you are moving towards the enemy ships alone, then chances are your game will be over in few minutes. At the top-left corner, there is a mini-map where you can see the location of teammates(blue ships) and enemy ships(red ships). If you see enemy ships are targetting you and there is no helper(teammate) near you it’s better to move to the locations where your teammates are camping. There are lots of rock on the battlefield which you can use as a cover. For example; if your ship is heavily damaged, then go behind the rock and cover yourself. Use the repair/heal ability to restore the HP. These rocks are also marked on the mini-map with the white outline. It would be better to target a single ship at a time and with the teammates. With this strategy, you will be able to destroy it fast. And if you have set your mind to target alone, then make sure to target a ship having low health. Just above the control icons, tap the circle type icon to check the HP(red bar) of enemy ships. This will show the HP of an enemy ship even if it’s not in range or far from the ship. In order to take fewer hits when fighting against the enemy, keep moving fast(tap the up arrow icon twice or rotate). On the other hand, if you are attacking from a single point or not moving the ship, it would be easy for the enemy to target you. You earn skill points in Pacific Warships game by leveling up. You can use these skill points to unlock or activate the skills of the commander. These skills can increase the damage power of ship, weapon rotation speed, movement speed, and much more. Go to the main screen of the game. At the top-left, tap your name. On the next screen, you will see a skill tree. Tap on a skill and spend the points. If you are not upgrading the ship, then it would be difficult to score in the battles. So must pay attention to the ship upgrades. An upgrade can increase the attack power of the ship’s weapons, speed of the ship, and almost all the attributes. On the main screen, at the bottom-right corner, tap the upgrade icon. Choose an upgrade; weapon, structure or more -> on the next screen, choose upper tier part and hit the upgrade button. It costs you credits and you need blueprints. Note: – As you level up, the high-tier ship will get unlock. So focus on it. Blueprints are required to upgrade the parts of a ship. Usually, you get this item by playing the game; by getting victories in the battle. But most of the time, you get low-quality parts(one star). If you are upgrading a high rank(tier) ship, then you need better blueprints(3-stars or higher). You can obtain these blueprints from the containers. Go to the main screen of the game, at the top-right corner, tap the shop icon -> go to containers tab -> there you can get container by watching a video ad, using coins, and premium currency(AU). On the main screen, at the bottom-right corner, just above the upgrade icon, there would be an ad offer; watch video ad and get free gold(10). If you need gold, then you should grab this offer. You can use gold to buy a premium container or blueprints or more slots for the ships. You can keep a fixed number of ships. To store more, you have only one option; buy the ship slots in exchange for gold. And if you are out of gold, then you will not be able to buy more ships until you have an empty slot. In this case, you can sell old ships(you are not using) for credits. Go to the ship menu -> select a ship that you want to sell -> view ship -> sell -> confirm.